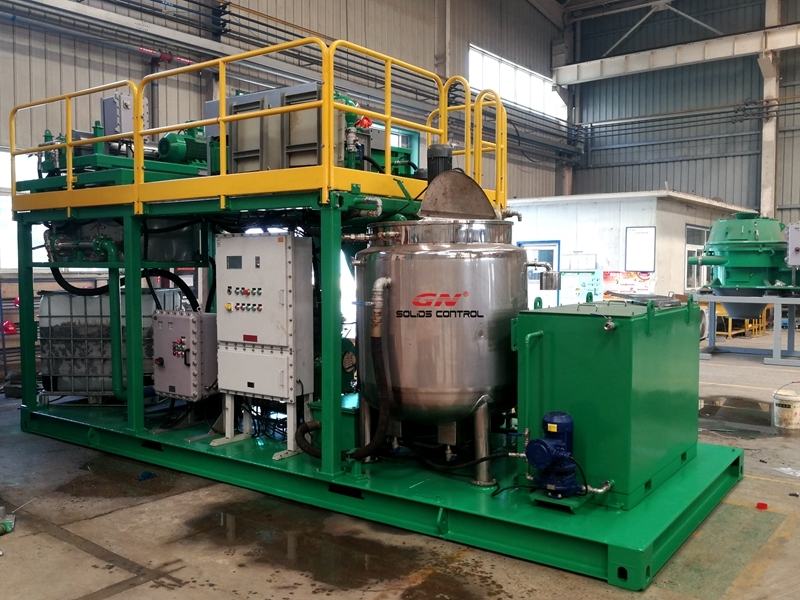 GN Oil Sludge Treatment System is to use chemical to wash the oil sludge with heat to temperature of 60-70 C degree. After washing the oil sludge is pumped to GN separation equipment to separate into oil, water and solids. The recycled water can be reused in the washing process which save a lot of cost to reduce the consumption of clean water, and the oil is clean enough to sell to the refinery company, the solids contain oil between 2%-3% which can be sent to biodegradation or thermal unit for final disposal. The main components for oil sludge treatment include slurry transfer pump, pre-mixing slurry tank, primary shale shaker, decanter centrifuge, 3 phase disc vertical centrifuge, chemical dosing system, storage oil tank , storage water tank. Slurry Transfer Pump: The vacuum pump can be used to pick oil sludge from the pit and feed to the pre-mixing and heating tank. At this stage, chemical dosing system will feed chemical the mixing tank to improve the separation of the oil water and solids. A submersible is used to pump the slurry to feed to primary shale shaker for separation of coarse solids from the oil sludge. The screen on the shale shaker normally use 2 mm opening screen, after separation by shale shaker, a second pump which is a screw pump will pick up the fluids with fine solids and feed to the decanter centrifuge. The decanter centrifuge is the core equipment for the oil sludge treatment. After decanter centrifuge, the relatively clean fluids will be sent to a 3 phase disc centrifuge to be separated to water, oil and fine slurry. Later on, the water can be used to washing and mixing the slurry, the recovery oil will be sent to the oil storage tank. You can visit our website www.gnsolidscontrol.com to learn more information of oil sludge treatment decanter centrifuge.